The choirs of Dublin Choral Foundation, The Lassus Scholars and Piccolo Lasso, will present The ESB Great Christmas Concert in the National Concert Hall on Thursday, December 6th 2018 at 8.00 pm. Special Guest, Irish-coloratura soprano Claudia Boyle will once again dazzle the audience with her vocal prowess! ESB Feis Ceoil Prize-winners pianist JJ McNamara (returning by popular demand!) and flautist Meadhbh O’Rourke will also demonstrate their exceptional skills! It promises to be another wonderful evening! Tickets from www.nch.ie Proudly supported by ESB. 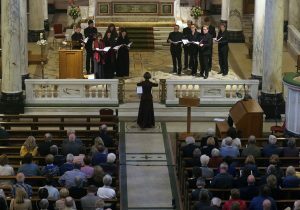 LASSUS to sing Concert in LONGFORD: Lassus, Dublin Choral Foundation’s new and exciting professional choir celebrates the wonderful restoration of St Mel’s Cathedral, Longford, by presenting a Unique Concert of Music, Poetry & Readings on Sunday Sept 16th 2018 at 8pm. The musical programme has been devised, in collaboration with poet Noel Monahan who will read many of his own evocative texts, to celebrate significant historic events in Longford – from the monastic sites of the 6th century to the recent restoration of St Mel’s Cathedral. The concert will bring you, the audience, on a moving and enthralling journey through the ages. The beautiful acoustics of the cathedral will be the perfect setting in which to hear timeless choral treasures from Renaissance masterpieces, including early Venetian polychoral psalm settings by Adriano Banchiero whose 450th Anniversary is celebrated in 2018, to Bruckner’s Locus iste and John Tavener’s The Lamb.